A Joshua tree flower in closeup. The Yoder Lab at California State University Northridge seeks exceptional, motivated candidates for the M.S. program in Biology. The lab opens in fall 2017 to study the coevolution of interacting species, particularly how mutualists shape each others’ genomic diversity, and how interactions between species can help or hinder adaptation to abiotic factors like climate. Our research particularly focuses on the yucca-yucca moth brood pollination mutualism and the legume-rhizobium nitrogen fixation symbiosis, using population genetics and genomics, phylogenetics, ecological fieldwork and greenhouse experiments, and both mathematical and simulation-based modeling. Planned projects include population genomic study of adaptation to extreme climates and specialized polliantors by Joshua tree (Yucca brevifolia and Y. jaegeriana) and experiments to study climate adaptation in barrel medick (Medicago truncatula). Students will be encouraged to develop independent projects with these or other local systems. CSUN and the Department of Biology offer graduate student support in the form of teaching assistantships and a variety of fellowships and aid programs. Research assistantships for up to one year of the two-year Master’s program will also be available through startup funding, and students will work with the PI to identify and apply for external support such as the National Science Foundation Graduate Student Research Fellowship. CSUN is in the San Fernando Valley in Los Angeles, surrounded by natural habitats ranging from coastal chaparral to the Mojave Desert and montane woodlands, and within a short commute of Santa Monica and Hollywood. CSUN was recently recognized by Nature as one of the top 25 Rising Institutions for Research in North America, and the Biology department has a reputation for turning out excellent Master’s students who often continue on to top-tier Ph.D. programs. The Yoder Lab is part of the Ecology & Evolution program, and our research offers connections to the department’s other programs in Molecular, Cellular, and Physiological Biology, Marine Biology, Microbiology, and Genetics and Developmental Biology. Ideal candidates will have previous research experience, familiarity with the R programming language, and a passion for science. Interested students should contact PI Jeremy Yoder at jbyoder@gmail.com. In your email, please describe your research interests, any previous research experience, and your career goals. Include a CV, if possible. Formal applications require GRE scores and transcripts, and are due February 15, though exceptions may be possible. 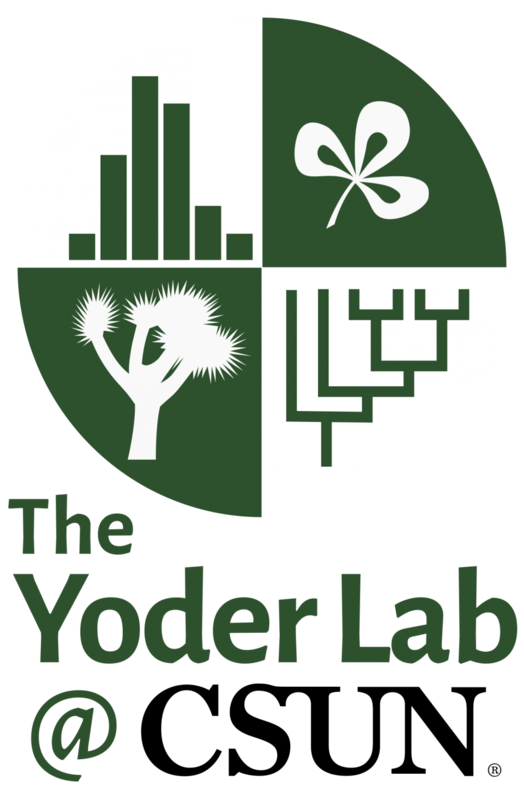 The Yoder Lab values diversity, and members of groups under-represented in ecology and evolutionary biology are especially encouraged to apply. This entry was posted in Lab business and tagged graduate school, recruitment by jby. Bookmark the permalink.